You can choose to have one room of carpet cleaned or you may choose to have all rooms of carpet cleaned. 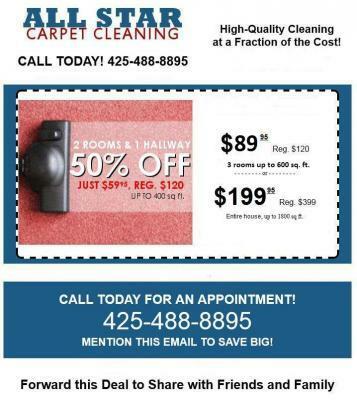 Inquire about our special spring carpet cleaning deals now. Our professionals are certified and highly experienced to take care of all Kenmore, WA carpet cleaning needs. We use safe solutions and carpet cleaning tools and materials that are completely safe for the home and the environment. Carpet cleaning can be a tough and strenuous job. Leave it to the professionals to save you all the hassle. Having a party? Clean carpets make the home inviting to guests. You can have those ugly stains and unpleasant odors removed now. Our professional carpet cleaning service offers great affordable prices along with a variety of easy payment options. We love to make things convenient and easy for our customers. We deliver prompt and efficient service for all Kenmore, WA carpet cleaning needs and you can schedule an appointment when it is most convenient for you. We respect all customers privacy and never share information with other companies. We highly value our customers and thank them for doing business with us. Have questions? Let our professionals help you. Contact us today at (425) 488-8895.